The Ask: Conduct a rapid research workshop with sales teams from 6 countries to identify the primary needs from a digital sales tool. Create a roadmap and feature set to evolve the current physical sales catalog into a digital sales tool. The Skullcandy brand has significant market presence around the world with a headquarters in located in Park City. Every years the Skullcandy brand team is tasks to create a product catalog to support their different sales teams. This is a timely task that results in a polished PDF, which acts as a beautiful brand document but falls short when it comes to actual sales. The analog nature of this document yields inaccuracies between the latest version of products, lacks localization on price and availability, and limits interactivity with customers when it comes to visualizing products in their store. Recognizing these pain point Skullcandy leveraged their annual sales meeting as an opportunity for me to conduct rapid research with the teams. While at Super Top Secret (design agency) I interviewed each team to better understand their current usage and workarounds, and had them generate idealistic concepts for future sales tools. These interviews were supplemented with research of their current catalog, calls with sales reps and industry research. Working within a quick timeline, I generated personas for the different roles that engage with the catalog. These roles were mapped against the overall sales cycle to list out the necessary activities within each phase. These aggregated activities became the basis for the feature list. This list was completmented by a set of design principles that would drive the experience of the interactive sales tools. These included aspects such as modularity, different editing and presentation states, offline mode, and localization layers. Assessing the current state of Skullcandy’s sales calendar and the most important items, I created a phased roadmap that outlined the different activities within phases to gradually evolve to the aspirational digital tool. 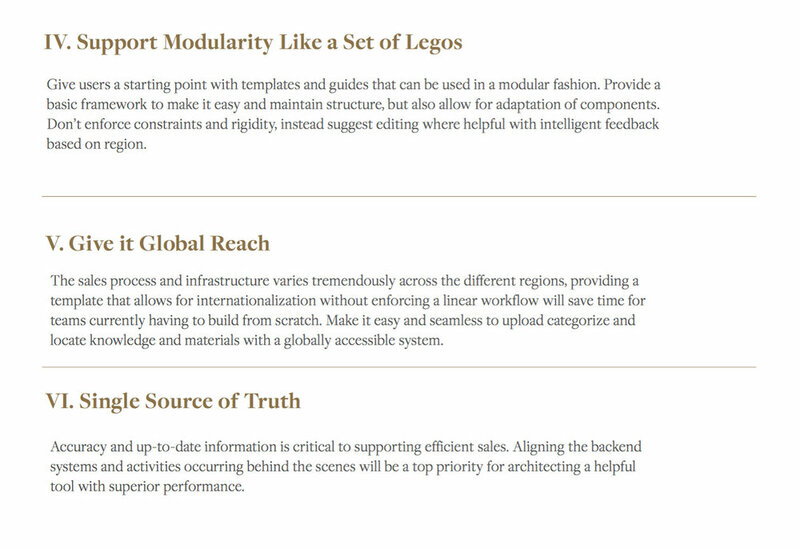 The first phase in the roadmap included a navigation model for how the most important features would be organized and a site map for future phases. This plan was presented to the CMO at Skullcandy and will be considered in their annual budget planning for internal initiatives.